Many people believe that the car makers the world over should stop developing their cars at the Nurburgring. The reason is the Nurburgring malarkey invariably results in hard-core cars that are really fast on the race track, but atrocious to drive on the real world. Car makers are not listening though. In fact, there are no more ‘Ring edition models than any time before, the Alfa Romeo Stelvio and Giulia NRING being only two of the very latest. These limited edition models celebrate Alfa’s relationship with the German track, a relationship that includes a fastest lap record for the Stelvio. They are limited to 108 cars each, and each come with exclusive exterior and interior appointment to show-off their superiority to the standard models. That superiority, though, is only superficial. Under the skin Alfa Romeo Stelvio and Giulia NRING Edition are both based on the QV model with the same 510 HP and torque of 600 Nm. Not that that’s too little. But it would have been nice if the Nurburgring edition of the Stelvio and Giulia QV had more power. At any rate, the NRING Alfas are still pretty enticing propositions. They come with a bespoke Circuito Grey paint job and feature carbon fiber dashboard plaque with the number of the car etched on it. Naturally, the cars are full option, boasting carbon-ceramic brakes, Sparco racing seats with red stitching and carbon shell structure, Mopar automatic transmission knob with carbon insert, leather and Alcantara steering wheel, also with carbon inserts, tinted windows, Adaptive Cruise Control, the Harman Kardon premium audio package, and the Alfa Connect 3D Nav infotainment system with 8.8” screen. Alfa Romeo has created a truly premium, complete, superlative brand experience for the 216 purchasers of the Giulia Quadrifoglio “NRING” and Stelvio Quadrifoglio “NRING” Nürburgring Limited Editions. The purchasing experience begins even in the run-up to delivery, as the car’s arrival is preceded by consignment of a numbered model to scale 1:18. There is another surprise in store when the car is collected: on board, the purchaser will find the Welcome Kit, comprising Sparco® racing gloves and customised soft shell jacket, sports bag in the Alfa Romeo pattern, “Quadrifoglio” cuff-links and the original footwear created by Car Shoe, Alfa Romeo licensee for a “Quadrifoglio” capsule collection. In leather and technical fabric, the shoes are inspired by race boot design and carry the symbol that most effectively embodies the Alfa Romeo brand’s highest performances. And there’s more: all Alfa Romeo Stelvio Quadrifoglio “NRING” and Giulia Quadrifoglio “NRING” owners will be able to attend, during 2019, a sports driving technique course on the Nürburgring circuit. A specific telephonic concierge service will assist NRING customers throughout their Alfa Romeo experience. 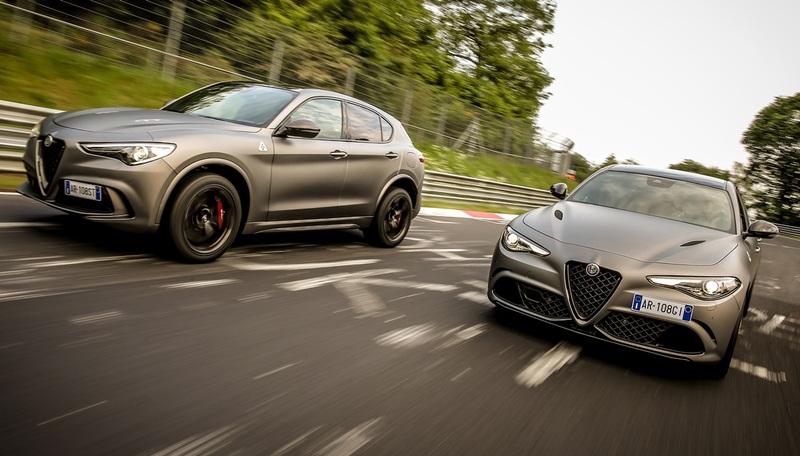 The post Official: Alfa Romeo Stelvio and Giulia NRING Edition appeared first on Motorward.